Radiology IT veterans share what worked for them when it was time to pack up and move their data. For many imaging facilities today, the issue isn’t whether to buy a PACS—most already have—but how to seamlessly upgrade their system. One of the biggest challenges when replacing a PACS is how to migrate your old database. Many earlier systems have proprietary data storage methods that can make replacing PACS more cumbersome. Other issues include training and stakeholder buy-in, as well as disaster recovery. However, Behlen says things get trickier when you choose a new PACS vendor. Migrating data from one vendor to another tests how closely both systems follow DICOM standards. Behlen says facilities don’t need to buy a new system from their current PACS vendor just because it will make the transition smoother. There are ways to deal with new vendors and the migration process to make the change effortless, he says. 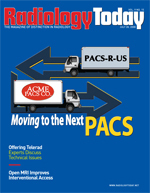 Richard H. Wiggins, III, MD, who serves as director of imaging informatics and medical PACS administrator at the University of Utah Health Sciences Center in Salt Lake City, says there are basically four options for migrating databases when switching from one PACS vendor to another. 1. Do it yourself. “You can move data with a simple DICOM query/retrieve command and just start pulling studies one after another from the old system to the new,” Wiggins says. This is probably the least expensive option; however, it will take the longest, says Wiggins. With DICOM query/retrieve commands, it will take about half the time it took to acquire the data to migrate it. “So if you have 10 years of data, it may take you five years to migrate the entire database,” Wiggins says. Another issue with this method is warranty. “Is your data still under warranty, and is your vendor still going to guarantee that your data is going to be there and accessible to you all the time—which is, of course, what you want?” he asks. 2. Have the company you are leaving migrate the data. The problem with this option, Wiggins says, is that your old vendor won’t be very motivated to help you migrate your data to someone else—you are, after all, leaving. “They’re angry that you are leaving and probably won’t want to help you migrate to a new system,” he says. 3. Have the new company migrate the data. The advantage to this option is that the new vendor is “obviously motivated to migrate the data and have you come over to them,” Wiggins says. The disadvantage, he says, is that it may require company No. 2 to invest in company No. 1. “Sometimes the old database needs to be upgraded before it can be migrated or there are interface engines that need to be created or coded to actually do the migration, and company number two doesn’t like to do that either,” he says. 4. Hire a consultant to migrate the data. “There are a lot of consultants who are very knowledgeable and experienced and who spend all their time migrating data from one system to another,” Wiggins says. More consultants are specializing in data migration as more imaging facilities are buying new PACS and are in need of their services, Wiggins says. Some PACS vendors now report that 60% or more of their new PACS installations are migrations, not initial analog to digital conversions of sites, he notes. The advantage to the consultant route is that the field is changing rapidly and it’s hard for imaging facilities to keep up with what is going on everywhere. “Having an outside consultant who does this all the time is sometimes very attractive because they can give you an outside view and let you know what’s going on in the industry,” Wiggins says. Tony Jones, PACS administrator at the University of Utah, says it helps to choose a new vendor or a consultant who has worked on your old PACS system before. “They will know the things you are up against,” he says. DICOM is quite mature now, Jones says, and migrating the images themselves generally isn’t that much of a trial anymore. “The nuts and bolts of moving the images was a real trial five years ago, but now it’s kind of cookie-cutter. Everyone sort of does it the same way. What trips people up is moving things like scanned documents or reports or making the demographics work in the new system’s framework for work lists and query filters and things like that,” he adds. It’s the DICOM tags that hang off the sides of the images that are the problem, he says. “That’s where you encounter PACS vendors that saved things in proprietary formats or they might use the structured reporting implementation of the DICOM standard, but all the tags are private so some other vendor isn’t going to be able to read those. That’s where it gets really tricky, and without cooperation from the old vendor or someone who knows how the database on the old PACS vendor works, you can be looking down the barrel of not being able to get those reports at all,” he explains. What most facilities do, Wiggins says, is have the new vendor handle the migration. “They try to include the cost of the migration in the contract and hopefully find out how much data is going to be migrated,” he says. Given the options, Wiggins says it is important to include in the new contract a “prenup” that says if you ever leave, the vendor will help you migrate the data. “You promise to give me the data back in some generic DICOM form by some amount of time because you don’t want the new vendor to hijack your data. You never want to be in that situation,” he says. Setting up a Web site where users can go for additional tips and training is another good idea, Wiggins says. “Have a mass e-mail account or some other conduit for mass dispersal throughout the institution, giving people little tips and letting everybody know they can use the up and down arrow keys just as they can the scroll bar and the wheel, for example,” he says. Also, try to have as many people as possible come for evaluations of the different PACS that you are seriously considering, Wiggins suggests. When the University of Utah Health Science Center replaced its PACS, it invited radiologists, surgeons, nurses, techs, and orthopedic staff to an RSNA meeting to test different systems and options, he says. It did the same when replacing its RIS, he adds. “We looked at all the vendors and had them give demos, and we had them set up time to meet with different groups and gave them different scenarios. For example, the ordering and billing people would meet with them for an hour, and they gave them their most difficult scenario: ‘The study is scheduled and ordered, then it’s changed and deleted and then contrast is added.’ Then we had the vendors meet with the techs and other groups, and everybody gave their feedback as to which system they liked best and what features they thought were important and if anything was a definite deal breaker. Then we democratically compiled the responses and we chose the system that was best for the institution not for any one group in particular,” Wiggins explains. As long as people are invited to participate, even if they choose not to, they can’t complain when the decision is made and they don’t like it, Wiggins says. When changing PACS vendors, Jones says it is easy to overlook a disaster recovery plan, but it is definitely not something that can be ignored. Behlen says that data migration should be an early consideration when choosing and installing new PACS systems. “When we started off in the business, it was more than half the time that [facilities] were already late in the project before migration was being addressed,” he says. Facilities that waited found it made the task more difficult. Fortunately, he says, many have learned that installing and implementing new PACS will be easier if migration is addressed up front rather than as an afterthought. — Beth W. Orenstein is a freelance medical writer and frequent contributor to Radiology Today. She writes from her home in Northampton, Pa..